Hello to all the wonderful Utopia clients! Planning a bar or bat mitzvah! Why I decided to go with Utopia Entertainment. 1) WE ALREADY HAVE A PHOTOGRAPHER. SHOULD WE STILL INVEST IN A VIDEO? Organizations that have experience in storytelling and capturing memories should understand the sensitivity and importance of preserving and capturing your moment. You then must justify whether its worth spending a couple thousand dollars to have a living breathing video. Is it worth the additional cost to have something to share with your kids and generations to come? For nonprofits, the question you must ask: Is it worth the investment to be able to show future donors and participants the intangible energy and experience at our events? Is it worth the investment to further spread our mission? A well done video should give you chills and help you relive the candid moments in real time…. giving you the full spectrum of emotion every time you click play. It should make the hair on your neck stand up and the tears freely flow down your cheeks. So, the question then becomes why do we put photography on a pedestal? It’s because photography is beautiful. Photography captures us (when done right) at our highest highs, or lowest lows and shows the raw emotion from that particular moment. Think about a decision, experience, vacation, purchase or victory you’ve had in the past….. Really think about that particular memory. What makes it special to you? How does it make you feel? Why does it make you feel this way? Humans are emotional creatures and emotion drives everything in our lives. We’re impulsive. We care with so much intention. We cry… oh boy do we cry. And we love. My gosh do we love deeply. The way something makes us feel is EVERYTHING. The best events, the best memories and the most memorable experiences we have in life all come back to one thing; the way it makes us feel. A great video does not capture one emotion or one moment. It captures all of them. Video should tell your unique story in a way that spotlights your event, tells your story, makes you cry, laugh and feel whole. 2) WHY IS VIDEOGRAPHY IMPORTANT FOR OUR EVENT? From our personal experience, videography is something that is cherished and sacred to the families and organizations that invest in it. We often receive messages of gratitude from past clients who had lost family members, but their memory lives on through video. While no longer here in physical body, one family was able to relive the memories of Grandpa moon-walking across the dance floor. A son was able to listen to his Father tell him how much he loved him, even after he had passed. A nonprofit organization was able to raise $175,000 at their Gala as they brought donors to tears by showing the impact of their donations. EMOTION is everything. Show your donors why they matter. Show your donors how their money changes lives. Tell your unique story. We think videography is worth every penny, but ultimately the decision is now in your hands. 3) WHAT SHOULD I BE ASKING TO ENSURE I AM GETTING THE HIGHEST QUALITY VIDEO AND TRAINED VIDEOGRAPHERS? 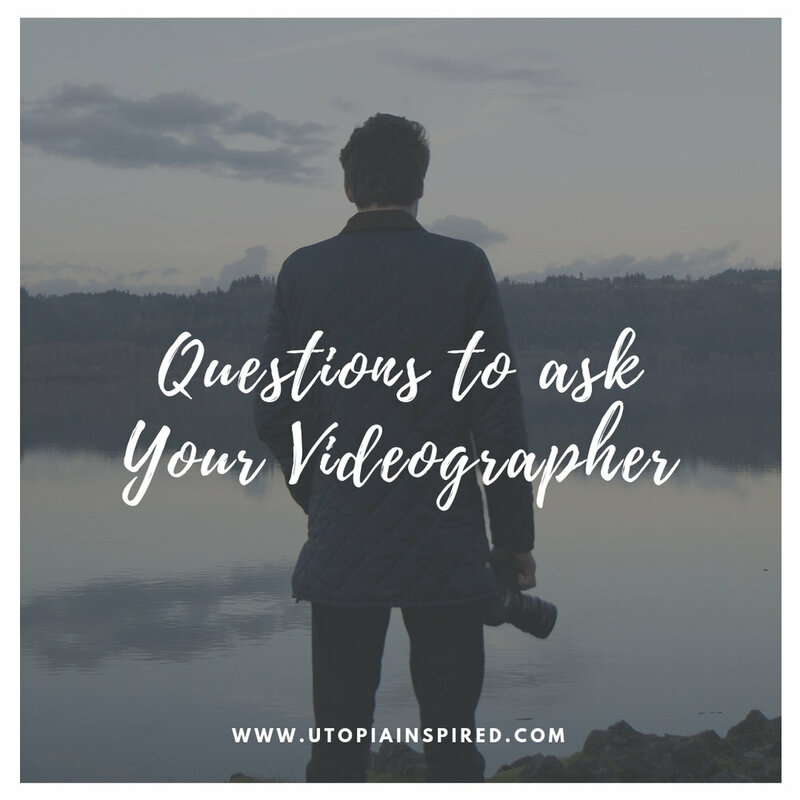 Here are a few questions to ask your videographer in regards to the quality, along with explanations on why these questions matter. What type of camera is best? We will spare you the technical jargon and just give you the details to ensure you get the highest quality video. DSLR cameras are great and they are very common in videography and photography industry. The majority of photographers and videographers are utilizing DSLR Cameras including Nikon, Sony and Canon. A few years back, high quality cinema cameras were nearly unaffordable unless you were working on a Hollywood budget film. Now that high quality cinema cameras are becoming more main stream, we highly recommend you book a video company that has access to Cinema Cameras. Cinema Cameras are also able to shoot up to 120+ FPS (frames per second) allowing for true slow motion without motion blur and choppiness. A few companies that make high quality cinema cameras include: Sony, Arri, Black Magic, RED, Panasonic and Canon. We find the Sony A7S2 and RED Scarlet W 5K make for a beautiful pair. The Sony A7S2 does exceptionally well in low light. If you have multiple videographers make sure they’re shooting on the exact same cameras OR shooting in LOG. What is LOG? All cameras have a different color temperature and the looks slightly differ. In other words, each camera has its own color personality. Shooting in LOG allows your editor to color the footage to match each camera PRECISELY to another. What that means—-you can have multiple videographers capturing different elements of your event and make the footage look identical as if your wedding was shot on one camera. Will you need LED lighting for your cameras to operate in low lighting? As important as the type of camera is the glass your videographer is using. The higher the quality the lens (glass) your videographer has paired with their camera, the better and more crisp the images. Most high quality cinema cameras are NOT designed with nighttime and low-lighting shoots in mind. That being said, it can be challenging to find a videography company that does not require forced lighting. Bright lighting at your gala or fundraiser is not ideal. Its intrusive and annoying to guests. Aim for better lenses (glass). Aim for more experienced videographers. These major details are worth the extra money. Are you able to export in 4k or 5k? 720p and 1080p will eventually become obsolete. If your videographer cannot export in 4k look elsewhere. How many video projects do you shoot per year? The more projects, the more experience! Videographers typically book 6-8 months ahead of time. Find your preferred videographer and plan to book them right after your venue, photographer and entertainment. What videos do you work on outside of nonprofit events and fundraisers? When you’re only seeing things through one lens (no pun intended) sometimes your perspective and creativity becomes jaded. Look to videography companies that have experience in shooting a variety of video projects. This will ensure you work with a well-rounded videography company that doesn’t have a one-size-fits-all mentality and portfolio. 4) WHAT TYPE OF VIDEO SHOULD WE CHOOSE? Typically 3-7 minutes long. Highlight videos showcase a particular event or experience. These are typically used to solicit future participants and sponsors; showing them what they missed out on and giving them something to look forward to next year. The length of these videos can range from 30 seconds to 5 minutes. Might we suggest 5 minutes MAX. These videos aim to raise awareness about a cause, however to do so, you often need to demonstrate a specific problem. Not all nonprofit mission videos need to be sad to be impactful. We find the use of humor to be a fun touch. Through creativity mission videos will help promote your organization’s fundamental message through empowerment and education. A commercial should aim to tell your organization’s founding story and connect you to the symbolism of WHY you do what you do. The video should pull in viewers immediately and establish an emotional connection that invites the viewer to join the movement. A call-to-action is very important here. 5) CAN WE CHOOSE OUR OWN MUSIC? You should be able to, yes. To some, this is an important element. However, may we suggest you do not choose your own music. Each video has a unique feel and story. An experienced videographer will choose music that fits your theme and story. Most videographers pay to access a database of license free songs. This allows you to share without worrying about upsetting a producer, record label or agent. If you choose to use licensed music by popular artists, sharing on Facebook, Instagram and other social media platforms is often flagged and deleted. Videographers put a lot of pride and joy into their art-work and love to showcase the quality of their end-product. Just because “KE$HA’S-TIK TOK” is your favorite song does not mean it belongs in your video. Your video company will have a knack for what belongs and what does not. 6) HOW MANY EVENTS HAVE YOU SHOT? WHAT IS YOUR TURN AROUND TIME? You should make sure that your videographer has captured other high-stress events that are time sensitive. It takes preparation and practice to manage flow, timeline, and all of the important aspects of a video shoot, especially when shooting a mission video utilizing story boards, multiple characters, shot lists, actors, multiple locations etc. Capturing any event requires intense concentration, experience and knowing where to be, when. Further, it takes a pro to manage all of that and edit in a timely fashion. Expect your turn around time to be within 90 days. If its more than that, might we suggest looking elsewhere. Your wedding videography company might make you pay more for an expedited edit if your request is same day / same week.